Vespertino would be located on the water front of Queens, facing Manhattan and Roosevelt Island. It has photochromic windows that darken during the day to create an intimate dining experience even during the day. The windows open at night, weather permitting, along with the solar roof to reveal the night sky. 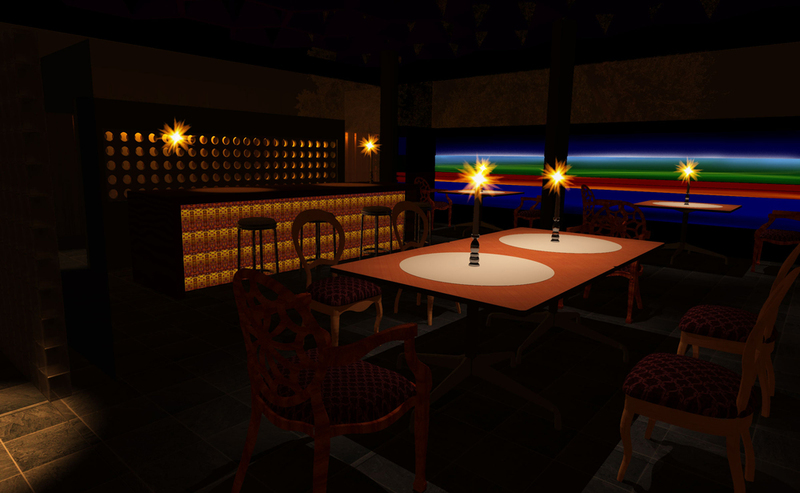 An exercise in developing an dining environment in a space based on the Barcelona Pavilion. The restaurant could be located anywhere and serve any type of food. Materials research was kindly facilitated with Materials ConneXion and the Pratt Interior Design Materials Library. Images were rendered in Vectorworks and finished in Photoshop. Early on in the exercise, I decided my resturant would serve tapas and therefore should have atleast a little Spanish influence. And thus the following color board was developed. Modular Solar Roof - Triangle cells arranged into hexagons forms solar cells on the roof, which is closed during the day to block the sun and absorbe solar energy, and opened during weather permitting evenings. Electrochromatic Glass Sliding Doors - Floor to ceiling glass panels make sliding doors that encloses the interior. These are intended darkened and closed during the day and like the roof opened in the evening when the weather is favorable. Luminated Color Glass - One of the walls of the resturant would be made from colored glass and be lit evenly by a combination of LED strips and diffusers. LED-Embedded Fence - The fence would be made of slats spaced unevenly so that gaps would let warm streams of light through. Outdoor Fireplace - Place in front of a small rectangular water pond, the light from the fireplace would add to the ambiance. View of the City - As a bonus, the city itself would participate in creating the atmosphere.